and maintain the academic excellence at our school. joining the PTSA and attending one of our upcoming meetings. 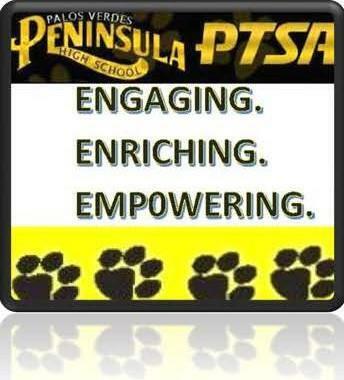 Help PVPHS PTSA recognize the people who have made significant contributions at Peninsula High School to promote our children's education and welfare by attending the PTSA Honorary Service Awards ceremony on Thursday, May 16 at 9am. How are PVPHS PTSA Funds Spent? Almost 100% of all donations and revenue from our fundraisers go directly back to PTSA programs or to Peninsula High! Thank you! Without your support, these programs would be reduced or not exist! ﻿Please visit the Costume Closet Website to learn about all they have to offer. We are genuinely grateful for the efforts of our Peninsula High PTSA. While most of us think of them as a fundraising group, don't be fooled. PTSA does so many more things for our students, including but not limited to, advocating for our district in Sacramento, providing hospitality services to the staff and community throughout the year, providing vital communication between school and the parents via the monthly "Paw Prints" publication, orchestrating and implementing mock elections for our student body, providing SAT and ACT workshops, teaching our students about healthy lifestyles via Yellow Ribbon Week and so, so much more. They, of course, also raise much needed funds without which this school would suffer on many levels. The funds raised by PTSA are spent on technology, software, special projects, and teacher instructional supplies.